Recent trends in the world of bassoon reeds have introduced one of the great debates for a new reed-maker: knife or file? There are many advantages to both tools; while files can remove cane very quickly over a broader surface area, a sharp knife is able to make a precision scrape without compromising the structure of the blade to the same extent. Knives do, however, require more time to master the skill of scraping. The other main issue with today's reed knives is the cost. The most recommended type of blade is the double hollow ground, which even at MMI will run you at least $40. With the cost of bassoons already so high, a young initiate to the world of reeds can't help but question the wisdom of the choices they've made. Personally, I balked at first at the cost of reed equipment and very often it still shocks me how costly some tools are. Opinel is a French knife manufacturer that produces quality blades for all types of purposes, from regular table knives to steak and chef's knives, as well as outdoor knives for camping, hunting, and much more. The blades are made of either carbon or stainless steel. The handles of most of their products are made of high quality wood and feel comfortable in the hand. The best part is, at least for a reed-maker, the price. Now, of course, this brings to mind several questions for the more discerning reed enthusiast: is it made well? Will it keep from wearing out and rusting? Will it hold its edge? And the answer to all of those is yes, and remarkably so. I was first introduced to the Opinel knife when I participated in an orchestra festival the summer of my junior year of undergrad. It was in a quaint seaside town in British Columbia. Every night after rehearsals we enjoyed exploring the town or heading to the beach right on the edge of the Puget sound. One day, for our "masterclass," the bassoon teacher took us aside to show us his reed-making process - pretty standard fare for a 2-week festival. The big takeaways from his lecture were to have cane ready in every step of processing, and to obtain one of these Opinel knives. He informed us that he'd been using one knife for several years without needing to sharpen it. While an oboist would cringe at the mention of such a fact, I was fascinated; because, naturally, I didn't like having to sharpen my reed knife every couple of days. The most important aspect of any knife is, perhaps obviously, the blade. But what goes into a blade? How does it maintain its edge and what factors determine this? For reed-makers, one of the most advertised features of a knife is the grind of the blade. Reed knives are generally made with a hollow (#1) or chisel (also known as bevel, #4) grind. The bevel grind makes for a very effective cutting edge - it is a typical blade grind for Japanese kitchen knives. Conversely, the hollow grind, often used for shaving razors, makes a blade that is exceptionally sharp but structurally weak. This means that it will need to be sharpened more often, and consequently will need to be replaced more frequently as well. As a side note, they should actually be sharpened using stropping, as opposed to using hard stone or glass (take note, oboists!). 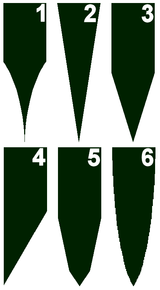 Opinel knives, in contrast, have convex blades (#6). This is basically the opposite of the hollow grind, where the blades curve outward instead of inward. This means that the blade is structurally stronger and is able to hold its edge well while maintaining a good amount of sharpness. To me, this is the perfect marriage between practicality and utility. Bassoonists do not strictly speaking need blades that are as sharp the hollow ground knives - we don't dig into the cane the way an oboist does because of a bassoon reed's tapered slope. Rather than sharpness, longevity becomes the name of the game; I've been using my Opinel No.8 for five years and I've never looked back. The handle feels comfortable in to grip, much more so than any reed knife, and I've only needed to sharpen it a handful of times. 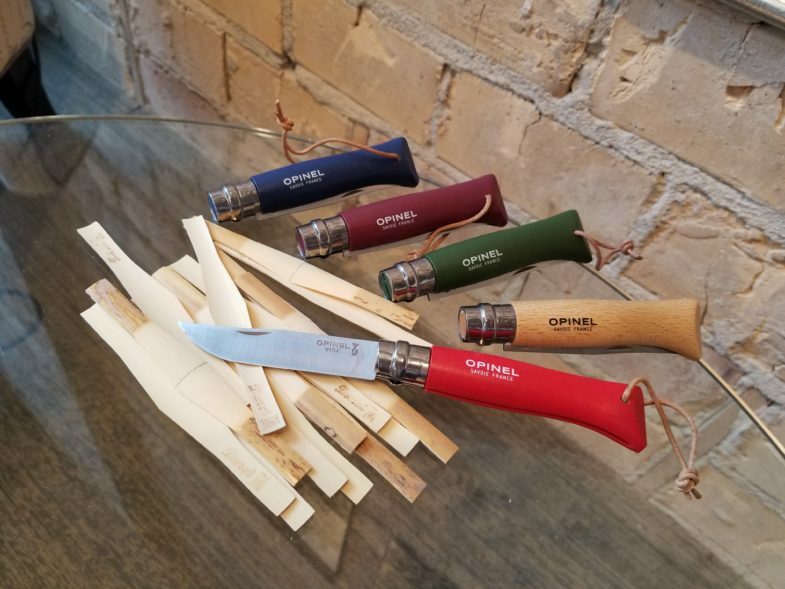 Opinel also has a fantastic variety of woods for their handles, and a plethora of other color options and even some etching patterns that look really amazing. In the future we hope to carry a greater variety of these types of handles. I think any practically-minded bassoonist will really fall in love with these knives, just like I have!